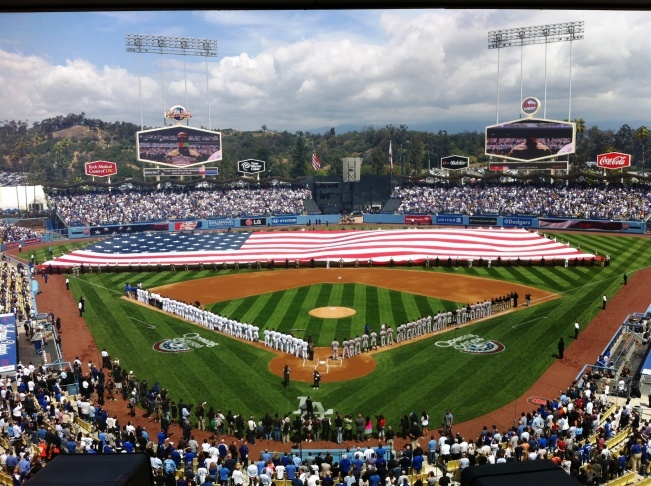 The Stars and Stripes came out as fans sang the National Anthem at Opening Day at Dodger Stadium. The Dodgers commemorate the stars from their history with retired numbers on the top deck pavilion. 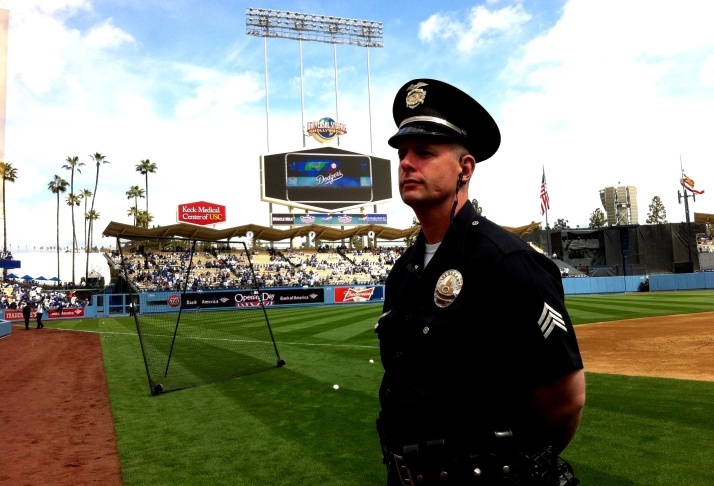 LAPD Sgt Jeff Nuttall says he loves being assigned to work Opening Day at Dodger Stadium; it's his 9th. 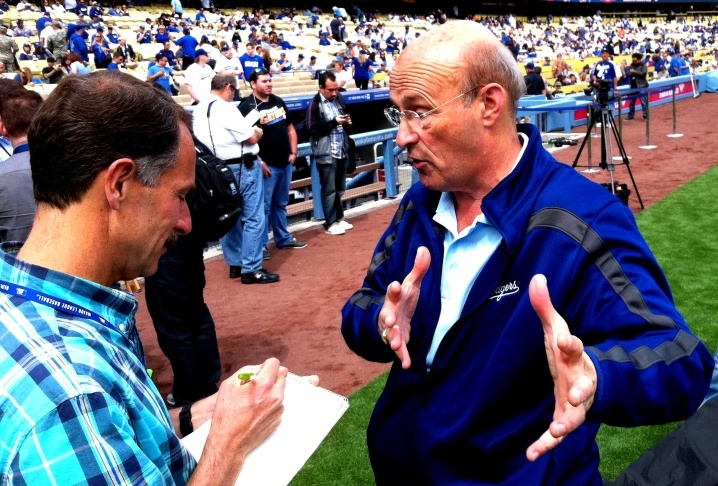 On the field before the first pitch on Opening Day, Dodger President Stan Kasten explains his vision to a journalist. 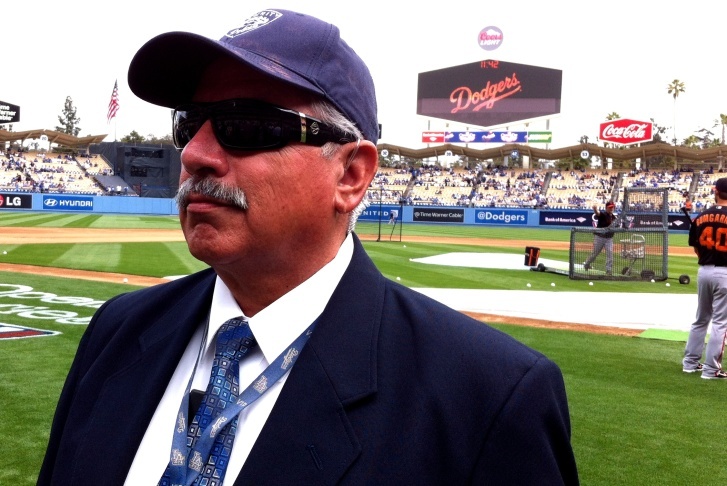 Richard Montano is not as severe as he looks; he's been working security at Dodger Stadium since 1981. 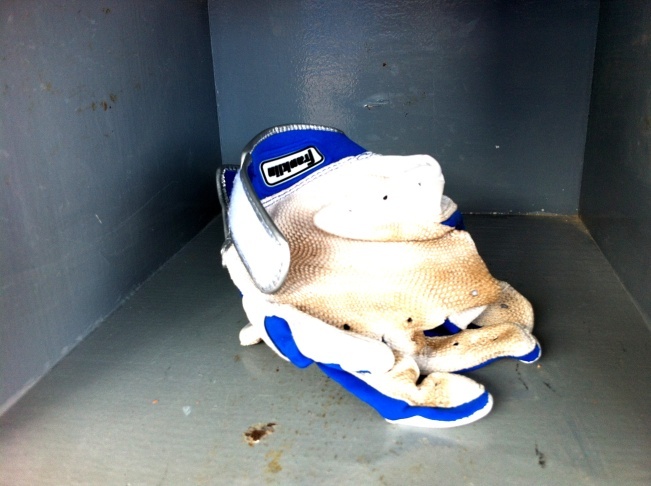 A nasty dirty batting glove int he Dodgers' dugout on Opening Day. 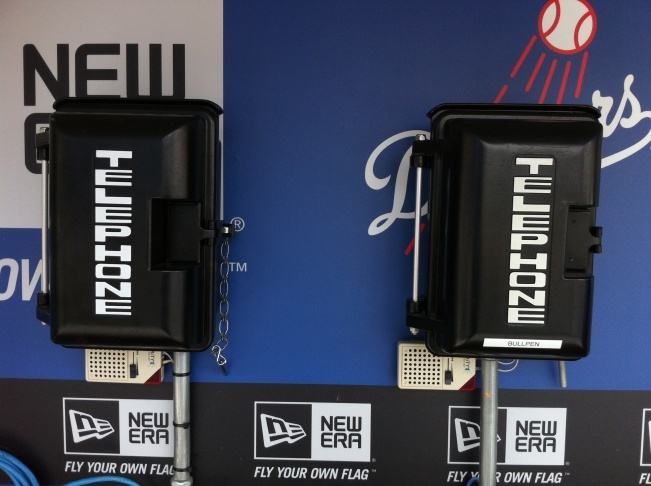 If you're the starting Dodger pitcher, you don't want to see the manager reach for the phone on the right. 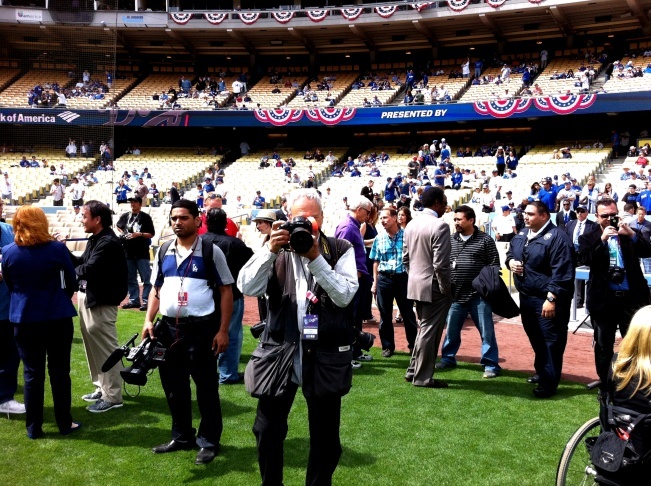 Photographer Gary Leonard stalks KPCC's John Rabe on the field at Dodger Stadium on Opening Day 2013. Clayton Kershaw hit his first career home run to break a scoreless tie in the 8th inning before finishing off a four-hitter today to lead the Dodgers Los Angeles over the San Francisco Giants 4-0. Kershaw became the first pitcher to throw a shutout and hit a home run in an opener since Bob Lemon for Cleveland in 1953. "What an awesome feeling," said Kershaw, who charged around the bases accompanied by a prolonged roar from the sellout crowd of 53,000. "I probably wasn't feeling my feet hitting the ground." A few hours before, Sandy Koufax’s ceremonial first pitch was a weak one-hopper, but the hundred-million dollars in improvements to the stadium were a home run for the fans. Finally. It’s been tough being a Dodger fan lately, and under Frank McCourt, things went from sketchy to ugly. KCBS sports anchor Jim Hill has been to two-dozen opening days, and, standing on the field during batting practice, he said you could feel the optimism. "It’s wonderful to see how the fans are coming out to support the team, but even more important than that, the new owners have put their money where their mouth is." Team President Stan Kasten helped make the Atlanta Braves the winningest team in baseball for a 15 season stretch, but here at Dodger Stadium, his job is harder than building a winning team. He’s waiting to see if the improved security, better amenities – like more stalls in the women’s bathroom -- and more logical logistics will convince fans the Guggenheim Group is sincere that this is a “new blue.” "I don’t want to prejudge the reaction," he said, watching the stands fill up. "We did something on every level of the ballpark. But I wait the feedback of the fans. That’s how we got most of our good ideas, was talking to fans, talking to customers. I’m sure a lot of that will continue, and that’s how we’ll know whether we’re on the right track or not." 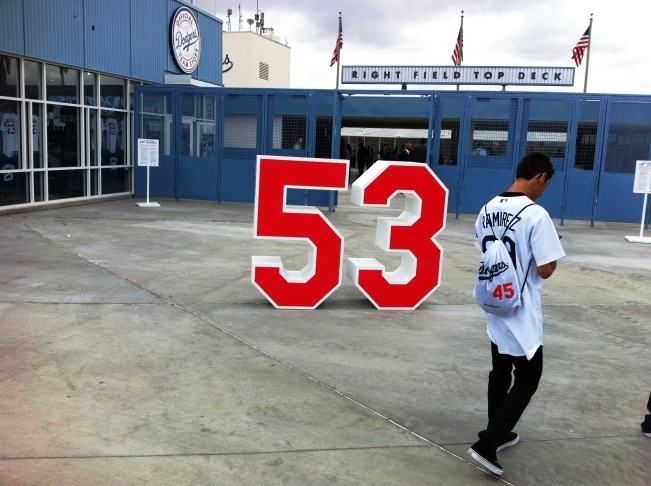 Jasmine Salas, a Dodger fan from Santa Fe Springs, told me the stadium passes the acid test. The bathrooms are now clean, instead of messy, and there are enough stalls, so she didn't have to wait in a long line. But does the stadium feel different? "It does feel different," she smiles. "A lot different, it’s a lot friendlier and it’s a lot more open and there’s a lot more space." A man with a big smile and a warm Southern accent came up to me and wanted to talk about his experience on Opening Day. Jimmy Churchman, from Tampa, couldn't but rave about his Dodger Stadium experience. " The food is good, the beer is cold, and everything’s good. This is what real baseball’s all about. If we could ever do something as big as this in the Tampa Bay area, we would really have a big thing. The whole atmosphere … everyone’s been so friendly to us. Just a lovely thing here." But Jimmy wasn’t wearing a Giants’ cap or uniform shirt, and that’s the real test. One more ugly incident, and all the fish tacos and wi-fi access in the world won’t fill up the stadium like in the good old days. One thing from the good old days hasn’t changed, by the way. Vin Scully got the biggest cheer of the day when he was introduced to help start the day, and later, up in the top deck, I heard a little transistor radio broadcasting Vin's play-by-play ... just like it was 2003, 1993, 1983, 1973, 1963, or 1953. "You gotta have Vin," a woman said. "Especially today."